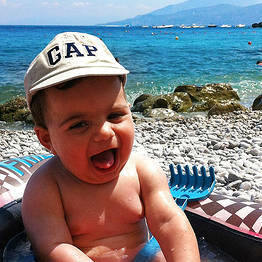 Are you planning a family vacation on Capri? Here are all our child-friendly tips, from beaches to restaurants. Since my first child was born, I have officially become a member of the Mommy Club, and I realize that travelling with little ones involves a bit more planning and logistics. Which is why I'm happy to share my insider tips with fellow parents to make your trip to Capri a perfect family vacation! 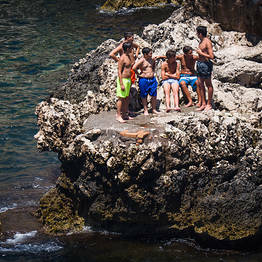 The Island of Capri is mostly pedestrian, which makes it the perfect place to walk with children, especially in the afternoon when the temperature drops and the crowds of daytrippers thins. The historic center of Capri town and the areas surrounding the Piazzetta (Tiberio, Tragara, Matermania, etc...) are closed to traffic. The historic center of Anacapri is pedestrian, as well. That said, there are pros and cons to the island being primarily pedestrian: though is no danger of passing cars, you also need to keep in mind distances when setting out for a long walk, because you'll have to walk back, as well! Capri: there is a small playground in the Giardini della Flora Caprense park. The park is located in the center of town, on a sidestreet near the Hotel La Palma. Anacapri: the playground is on Via G.Orlandi, a pedestrian lane. 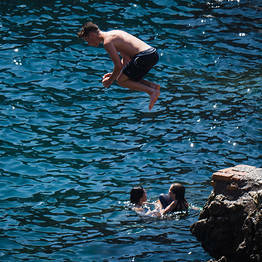 ...though here on Capri we consider the beach the playground in the summer! 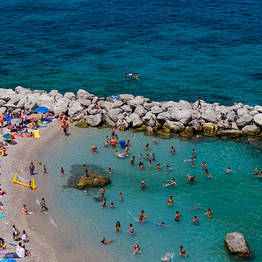 Don't expect sweeping sandy beaches...on Capri, the beaches are all rocky cliffs or large pebbles. The water gets quite deep already 2 or 3 meters from the shore, so make sure you have floaties, water wings, or other floatation devices for non-swimmers. When my son was an infant, I would fill a small inflatable canoe with a few buckets of sea water and let him play in there safely. If your children a bit older, make sure to bring snorkeling gear as the rugged coastline is full of interesting fish and underwater sealife. 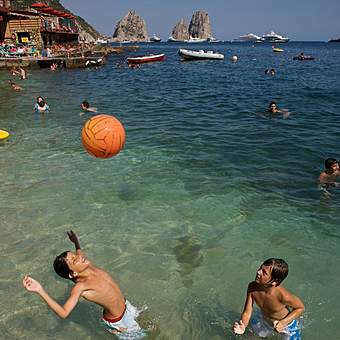 This is the largest beach on the island, and where most of the children on Capri learn to swim. Most of the beach is free and the most suitable stretch for children is the scogliera, where a natural breakwater protects from the largest waves. At high tide, a tidepool forms here with trapped seawater about 30 centimeters deep. This area of the beach is mostly taken over by families during the school holidays in the summer (from June to mid-September), so couples looking for a quiet day at the seaside are best advised to choose another area of the Marina Grande beach! 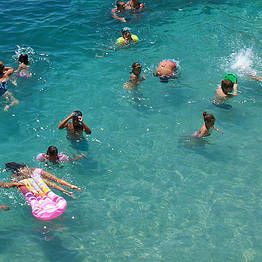 Bagni Le Ondine: organizes swim courses for children each summer. Restaurant: da Zio Ciccio (located on the public beach). SInce this is a small beach, it is often crowded. That said, in the early morning hours it is usually quiet and a nice place for a swim (even in high season). There are a number of beach establishments and a few stretches of free beach. You can reach this beach by boat or on foot (but keep in mind that it's a LONG walk). The free beach is protected by a breakwater, so perfect or little ones. Most of the restaurants on Capri are child-friendly, though don't expect to find playgrounds or changing tables. If you're lucky, they'll have a high chair for you. The most kid-pleasing dishes on Capri are pizza, ravioli capresi, pasta with tomato sauce, veal cutlets, french fries, desserts, and gelato. At the beach, a mozzarella and tomato sandwich (known as a Caprese) or a ham sandwich are your best choices. If you are at Marina Grande, try the Caprese sandwich at the Salumeria Da Aldo. For the best gelato, stop by Buonocore near the Piazzetta...just follow the scent of freshly-made waffle cones. Warming bottles and baby food: simply ask politely to have your bottles or baby food warmed and you shouldn't have any problems. Children under 6 ride both public buses and the funicular free on Capri. Strollers can be transported for free (and must be closed on buses). Children under 3 year old travel free; older children may have discounted tickets depending upon each individual ferry company. You can check our page with updated schedules a few days before your travel dates. Make sure your stroller has a sunshade, as you will need it to protect your infant from the island sun. Bring a light cotton blanket in the summer, as there is often a breeze in the afternoon and you may want to cover your napping baby in the stroller. For baby food, diapers, and other supplies, you'll find that the pharmacies on the island are well-stocked. They even carry organic lines.